You are here: Home / Recipes / Dinner / Vegetable Couscous Recipe! 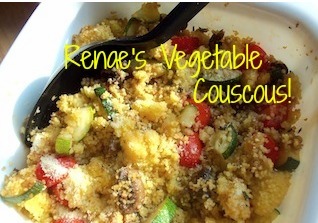 Renae’s Corner: Vegetable Couscous Recipe! Couscous is very easy to make if you are in need of a quick meal. My boys actually prefer it over rice! Couscous comes in a whole grain version too! Heat oven to 350 degrees. In a saucepan heat vegetable stock to a boil. Add couscous, stir and return to a boil. Place the lid on the pan and remove from heat. Let the couscous sit for 5 minutes. In a skillet heat olive oil. Add garlic, zucchini and mushrooms. Saute for about 5 minutes or until soft. Add tomatoes and cook for another minute. Place couscous in a small casserole dish. Add vegetables to couscous and mix. Add dash of balsamic vinegar and basil. Sprinkle with parmesan cheese. Use vegetables you have on hand- onions, bell peppers, yellow squash or eggplant would also be good. Experiment with spices. Curry is a popular spice to use on couscous. Add diced chicken and make it a whole meal!